Thank you to the groups below that are so essential to ensuring that as many fallen heroes are remembered and honored at Fort Rosecrans National Cemetery (CAFRNS) on Saturday, December 14, 2019 at 9:00 AM. REMEMBER the Fallen. . . HONOR those who Serve. . . TEACH our children the value of Freedom..Help us honor and remember as many fallen heroes as possible by sponsoring a wreath. Please scroll to the bottom of this page for a selection of cemeteries we are supporting and select "Sponsor" to make your donation.Thank you on behalf of Northrop Grumman VERITAS and Corporate Citizenship. Welcome to Camp Pendleton Young Marines (CA0008P)! Our location fundraising group is proud to support Miramar National Cemetery and to help honor and remember as many veterans as possible. Please click "View" to learn more about our effort and then click "Volunteer" to join us for National Wreaths Across America Day. Thank you so much! 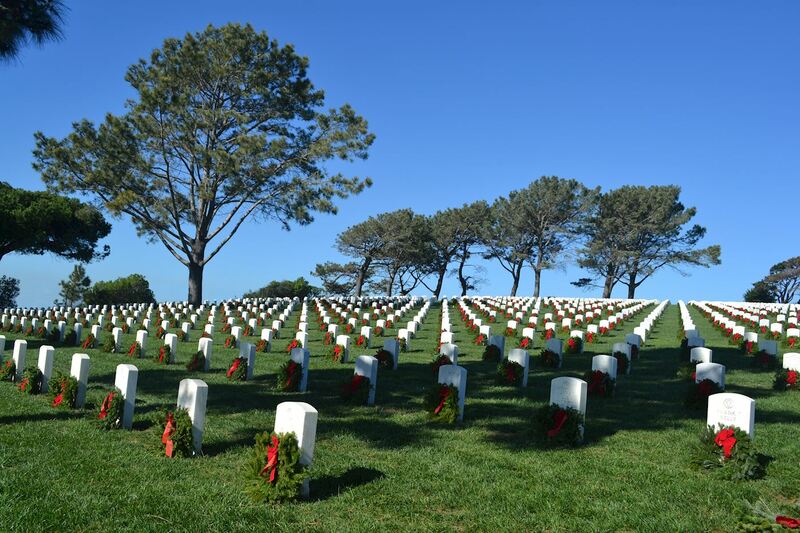 Welcome to Wreaths Across America San Diego- Fort Rosecrans (CA0022)! Our location fundraising group is proud to support Fort Rosecrans National Cemetery and to help honor and remember as many veterans as possible. Please click "View" to learn more about our effort and then click "Volunteer" to join us for National Wreaths Across America Day. Thank you so much! Welcome to Altrusa International Club of San Diego (CA0001P)! Our location fundraising group is proud to support Miramar National Cemetery and to help honor and remember as many veterans as possible. Please click "View" to learn more about our effort and then click "Volunteer" to join us for National Wreaths Across America Day. Thank you so much! Welcome to US Daughters of 1812 San Diego Chapter (CA0023P)! Our location fundraising group is proud to support Fort Rosecrans National Cemetery and to help honor and remember as many veterans as possible. Please click "View" to learn more about our effort and then click "Volunteer" to join us for National Wreaths Across America Day. Thank you so much! Welcome to Rancho Buena Vista Chapter NSDAR (CA0036P)! Our location fundraising group is proud to support Fort Rosecrans National Cemetery and to help honor and remember as many veterans as possible. Please click "View" to learn more about our effort and then click "Volunteer" to join us for National Wreaths Across America Day. Thank you so much! Welcome to Edith Macias Vann Southern California, Women Marines Association (CA0018P)! Our location fundraising group is proud to support Fort Rosecrans National Cemetery and to help honor and remember as many veterans as possible. Please click "View" to learn more about our effort and then click "Volunteer" to join us for National Wreaths Across America Day. Thank you so much! Welcome to US Naval Sea Cadets Fort Fisher Division/TS Essex 113 (CA0080P)! Our location fundraising group is proud to support Fort Rosecrans National Cemetery and to help honor and remember as many veterans as possible. Please click "View" to learn more about our effort and then click "Volunteer" to join us for National Wreaths Across America Day. Thank you so much! Welcome to American Legion Post 365 (CA0252P)! Our location fundraising group is proud to support Miramar National Cemetery and to help honor and remember as many veterans as possible. Please click "View" to learn more about our effort and then click "Volunteer" to join us for National Wreaths Across America Day. Thank you so much! Welcome to Presidio Hill Society, N.S.C.A.R. (CA0258P)! Our location fundraising group is proud to support Miramar National Cemetery and to help honor and remember as many veterans as possible. Please click "View" to learn more about our effort and then click "Volunteer" to join us for National Wreaths Across America Day. Thank you so much! Welcome to Team Lococo (CA0271)! Our location fundraising group is proud to support Fort Rosecrans National Cemetery and to help honor and remember as many veterans as possible. Please click "View" to learn more about our effort and then click "Volunteer" to join us for National Wreaths Across America Day. Thank you so much!